The UK’s self-employed population has grown rapidly over the last ten years. According to the Centre for Research on Self-Employment (CRSE), almost five million people, equating to fifteen percent of the UK workforce are now self-employed. Thus, as contracting becomes increasingly important to the UK economy, it is vital that individual wellbeing is taken into consideration, to help boost quality of life and work. The CRSE recently published a report called The Way to Wellbeing, which offers a new way of looking at self-employed wellbeing based on overall life satisfaction. While the report reveals that contractors are overall more satisfied than permanent employees, there are still improvements that can be made. For example, one area where they are less satisfied is household income. 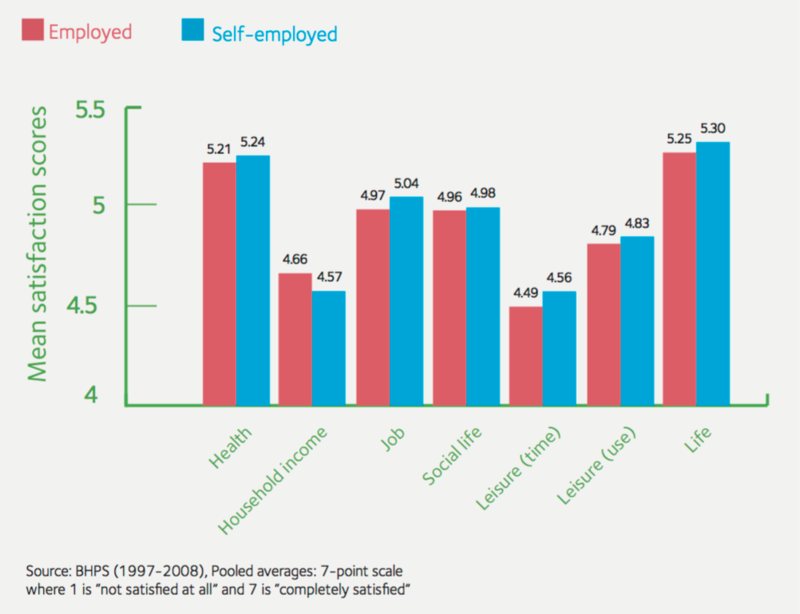 (See below for a chart on life satisfaction of the self-employed and employees in the UK by life domain). CRSE went on to provide recommendations as to how the government and business leaders can help to further improve self-employed wellbeing. Offering training and mentoring to build confidence for the self-employed; improving access to skills development resources tailored to contractors. CRSE also suggested that the Treasury could make skills development more cost-effective by extending tax allowances to cover new skills and by granting self-employed people training vouchers. They argue that creating a more appreciative culture where business failures are seen as a normal part of entrepreneurial life, not as personal failures of the self-employed could hugely improve wellbeing. One specific suggestion they gave is to reform bankruptcy regulation to allow for good faith business failures. CRSE want to ensure better and faster access to mentoring when first starting out as a contractor and during business crisis periods to lower stress and improve conviction in crucial times. They suggest that the banking industry should introduce contractor-friendly banking services, as well as informational campaigns and online resources to promote existing funding and emergency credit initiatives. They proposed that the Department for Work and Pensions (DWP) and pension providers should introduce financial products and more information and guidance specifically tailored to the self-employed about saving for later life. At Cloud9 Umbrella and K&B Accountancy Group, we believe in putting contractor wellbeing first. This is why we provide continued support and a one-stop-shop solution for our clients to help make their contracting life a lot simpler and stress-free. What’s more, our rewards and benefits scheme Kingsley Hamilton Lifestyle offers a wide range of discounts and deals to help you save money on your self-care. Whether you need a little retail therapy, a spa day or even a weekend getaway, there is something perfect for you. Taking time for yourself as a contractor is very important, so take advantage of the scheme and start working towards building a better work-life balance for yourself. New to contracting, only looking to contract for a short time or maybe you are looking for a new umbrella company? Join Cloud9 Umbrella this summer; they will not only take on the administrative burden of contracting for you, but also for a limited time only, they will process your first pay slip free of charge, and if you choose to stay, they’ll give you another 4 weeks of service for free too! Sign up now. If you’re looking to switch accountants, we know the last thing you need is a long drawn-out and expensive changeover process. So K&B Accountancy Group has created a switch solution that is quick, efficient and most importantly free! Switch today and pay nothing for a ‘catch up’ service of your previous year’s accounts and corporation tax return*. Join now!